The Miami Marlins are in the market for a closer this week at MLB’s Winter Meetings. This is a bit surprising, considering AJ Ramos has saved 72 games for the club over the last two years while striking out 160 hitters in 134 1/3 innings. It’s even more surprising when you hear that the Marlins are considering throwing stupid money at one of the top closers on the market. Marlins still intent on adding top closer. Word is, Loria loves Chapman. They are Jansen fans, as well. Rival clubs believe #Marlins willing to offer Jansen five years, $80M and lose No. 14 pick in draft. Marlins say they’re still discussing. 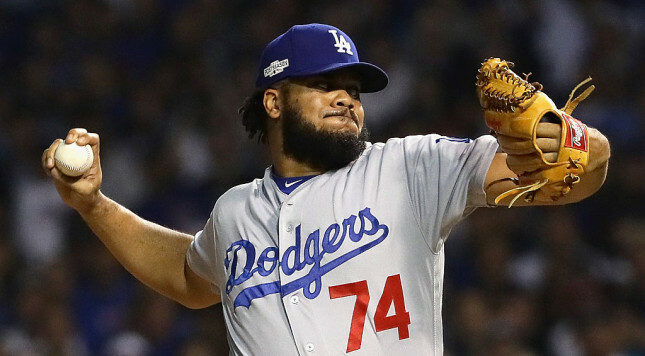 Five years and $80 million for Kenley Jansen would be patently absurd, the largest contract for a reliever in baseball history. Not to say Jansen isn’t worth it – he saved 47 games in 2016, punching out a whopping 104 hitters and walking just 11 in 68 2/3 innings. Over the last five seasons, the only reliever to top Jansen’s 11.4 fWAR is fellow free agent Aroldis Chapman. Only Craig Kimbrel and Chapman have more saves than Jansen, and Chapman is the lone reliever to top Jansen in total strikeouts. But while Jansen would fit nicely in the Marlins bullpen, they need more than him. The team’s rotation was a weak point even before the tragic death of Jose Fernandez, and now, it’s a bonafide sinkhole. Miami’s best returning starter is Adam Conley, who had a 3.85 ERA in 133 1/3 innings. Conley, Tom Koehler, and Wei-Yin Chen were the only Marlins starters to top 100 innings last year, and the latter two both had ERAs over 4.00. Miami did add Edinson Volquez on a two-year deal, and they need to hope he pitches more like the Volquez of 2014 and 2015 (ERAs of 3.04 and 3.55, respectively) than the Volquez of 2016 (5.37 ERA). Of course, this isn’t the best market to be in the hunt for starting pitchers. With ex-Marlin Andrew Cashner, Bartolo Colon, and RA Dickey all of the market, the best starters left are older (Jorge de la Rosa, Scott Feldman, Doug Fister), injury-prone (Brett Anderson, Rich Hill, Kris Medlen), or come with significant uncertainty (Mat Latos, Ivan Nova, Tyson Ross). A top closer won’t make the Marlins contenders, despite their young, dynamic offense. Their rotation just isn’t good enough. That $80 million would be better spent upgrading the starting five, because frankly, a bullpen consisting of Ramos, Kyle Barraclough, Brian Ellington, Nick Wittgren, and maybe David Phelps might just not need a top-tier closer like Chapman, Jansen, or Mark Melancon in order to make up for the deficiencies of the team’s rotation.